To make the Crepes: In a small pan, heat the butter over low heat until it melts. Set it aside. Place flour, eggs, milk, sugar, salt and melted butter in the blender and purée until smooth, for about 10 seconds. Add water and blend again until smooth. You can also mix the ingredients by hand, following the same order. Place batter in a container, cover and refrigerate for at least half an hour, up to 12 hours. Once ready to make the crêpes, whisk the batter well with a fork or a whisk. Set a crêpe pan or nonstick skillet over medium-high heat for a couple of minutes. Butter the bottom of the pan and ladle about ¼ cup of batter onto it. Instead of working from the center to the sides, tilt the pan and pour the batter over one side and spread it as quickly as possible to the rest of the pan, so that it covers the entire surface. Cook for about 20 to 25 seconds, until edges are cooked and begin to dry out and the bottom of the crêpe is lightly browned. With a small spatula or fork, lift one edge of the crêpe and turn it over quickly with your fingers. Cook the second side for about 10 to 15 seconds, or until it has lightly browned. Flip the crêpe onto a plate. Repeat with the rest of the batter. After 3 or 4 crêpes, you may need to butter the pan again. If it isn’t a nonstick pan, you may need to do it for every one. Stack crêpes on top of each other with the first, darker side down. That darker side will become the outer layer of the crêpe once you fill them up or fold them. If you aren’t going to use all of the crêpes at once, or if you are making them ahead of time, wrap them in plastic wrap and place them in a closed plastic bag and store in the refrigerator up to 4 days, or in the freezer for weeks. To make the Sauce: Pour the cajeta and the milk in a saucepan. Heat over medium heat, stirring and gently simmering it for a couple of minutes until it is completely mixed together and well dissolved. 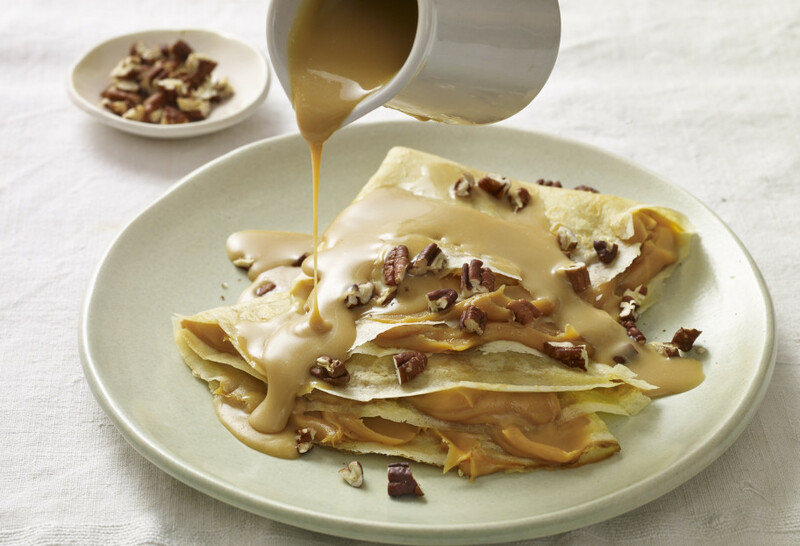 To Assemble: Place a crêpe on a plate and spread a couple tablespoons cajeta sauce all over the surface. Fold crêpe in half, add a couple more tablespoons of sauce into the middle of the half-moon shape. Fold the crêpe again to make a triangle shape (with a rounded bottom) and pour a few more tablespoons of sauce on top.